Anti-aging skin care products promise the world, but do they really deliver? It seems as though every other week a company comes out with the magical potion that will get rid of wrinkles and turn your skin as smooth as a baby’s, but unfortunately, buying those anti-aging treatments and slapping them on your face is not quite enough. Different anti-aging skin care ingredients work differently, and the secret to truly getting the skin to look smoother and a little more youthful is knowing how to combine them into one epic smoothing, rebuilding and protecting routine. It’s also important to know which anti-aging products are worth buying, so in this article I have collected 21 of the best options to try. I also go into detail about everything to do with anti-aging skin care, including what skin aging is and what causes it in the first place. Only once you understand the causes will you understand how truly good anti-aging skin care works. I explain what kind of anti-aging products and treatments exist, and what the best anti-aging skin care ingredients are. I give suggestions for how to care for your skin at different ages and with different skin types, and to cap things off I mapped out the ultimate anti-aging skin care routine to help get rid of wrinkles (or at least prevent them). It’s a comprehensive routine that puts the different kinds of products together in order to maximize the effectiveness of each one of them. To finish things, I give a few extra lifestyle tips that’ll help you feel youthful, and I end on what I hope is a note that will keep you practicing self-love! • What Is Skin Aging? • What Causes Skin Aging? • When Should You Start an Anti-Aging Skin Care Routine? • How to Choose the Right Anti-Aging Products for Your Skin Type? 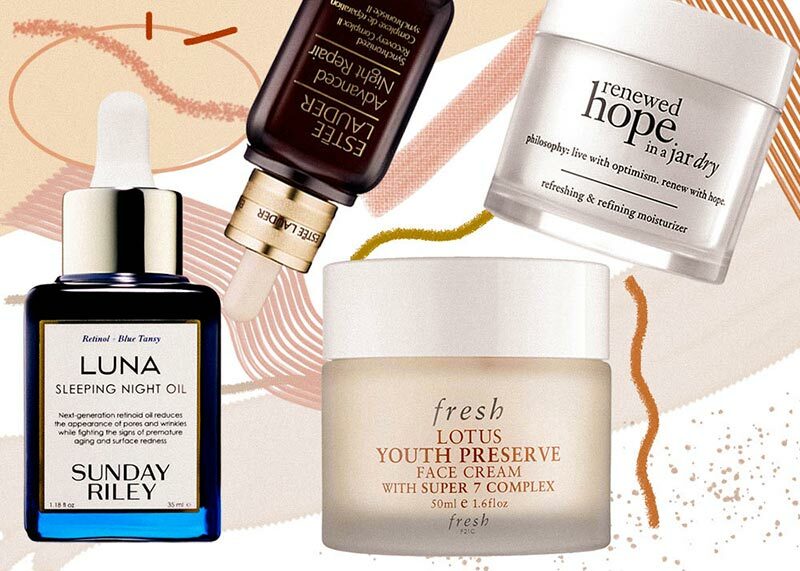 From the magical wrinkle cream to treatments that prevent premature aging, below you will find 21 of the bestselling anti-aging products for skin that really work. Fragrance-free anti-aging creams are a must for those with mature yet sensitive skin. However, this moisturizer goes above and beyond, also delivering restoring peptides to the skin to help rebuild collagen, making it one of the best anti-aging skin care products on the market. It is a great choice for those with maturing combination, dry, and normal skin, as it is on the more moisturizing side. It is sold online through Sephora. Moisturizers can be some of the best anti-aging products, as long as they really deliver on the hydrating promises. Hyaluronic acid and betaine keep this formula as hydrating as it gets, to plump up the skin and minimize the look of wrinkles. It also includes vitamin E and vitamin C to prevent free radical damage and to repair the skin. It is available for sale via Sephora. The various forms of vitamin A are considered the best anti-aging treatments, but in most formulations, they can be drying and irritating to the skin. The trans-retinoic acid ester in this face oil, however, is gentle yet effective for promoting skin regeneration and smoothing the skin. It comes in an antioxidant-rich natural formula with a ton of moisturizing and skin-healing oils that are suited to dry and normal skin. You can buy this oil from Sephora. As we age, our skin slows down its production of fatty acids, ceramides, and cholesterol, which come together to make up what is known as our skin barrier. By using a moisturizer that replenishes these ingredients, the skin can hold on to moisture more easily and ends up looking plumper and less wrinkled. If your skin leans towards dry, then this anti-aging moisturizer is for you, so get it online from Dermstore. Estee Lauder is one of the biggest and oldest names in skin care, and for a good reason. Their serums have been some of the best anti-aging treatments on the market for many years, with this one considered a classic. It contains skin-fortifying ferments, tightening caffeine, and a ton of humectants, and works for all skin types. You can find it at Sephora. A sunscreen is key when it comes to anti-aging treatments, since it is the best preventative of all. This sunscreen, however, works double time, since in addition to protecting with an impressive SPF, it also fortifies the skin and helps to rebuild collagen with Matrixyl 3000. It’s a hydrating yet lightweight formula that works for all skin types, and is available for sale at Sephora. This robust serum is made with La Mer’s signature miracle broth, along with some proven skin care actives to fight premature aging. It hydrates the skin and loads it up with much needed vitamins and minerals to fortify and protect. Many reviewers notice a visible firming and lifting effect on their skin. It can be ordered from Net-a-Porter. This eye cream holds everything the aging eye area needs, though it’s also fantastic for prevention, making it one of the best anti-aging products for the eyes for all skin types. It contains caffeine to tighten and fight inflammation, vitamin C to repair, brighten, and protect, and even some collagen-promoting peptides. You can find it at Sephora. The area around the eyes needs gentle care, but that doesn’t mean that it can’t benefit from the best anti-aging products around. This anti-aging cream does the trick, by seriously hydrating the eye area while also loading it with vitamin C and a trademarked blend of peptides. This eye cream also gets bonus points for coming in a jar. Pick it up online through Dermstore. This lightly resurfacing serum is one of the best anti-aging products for those also wanting to brighten up the skin. It includes two different types of vitamin C, along with antioxidant niacinamide and co-enzyme COQ010. Light exfoliation comes courtesy of lactic and mandelic acids. It is a great choice for all skin types except the extremely sensitive, and is especially great for fortifying the skin and eliminating hyperpigmentation. Order it from Net-a-Porter! This anti-aging eye gel hydrates, firms, and soothes the eye area without feeling heavy or leaving behind a film. It sinks in quickly, saturating the skin around the eyes with all kinds of hydrating and soothing ingredients. It is loaded with antioxidant extracts, and also features protective ceramides. Buy this eye cream from Sephora! This incredible anti-aging serum is like a cool drink of water to the skin. It saturates it with moisture, instantly plumping it up and helping to minimize the look of wrinkles. It features fortifying and hydrating ferments, a ton of glycerin, and some hyaluronic acid for added measure. As long as you don’t have any fungal or yeast-related skin issues, you can use it, and it can even replace a moisturizer for those with oily skin. This serum is available at Sephora. Wiping your face with these pads will help you wipe away wrinkles over time. Okay, perhaps this is an exaggeration, but these exfoliating pads really are wondrous. They renew the skin with a blend of AHA, BHA, vitamin A, and vitamin C, while also hydrating it and protecting it with a collection of antioxidants. Best of all, they’re great for all skin types! Buy these amazing pads at Nordstrom! While a facial cleanser can never be an anti-aging miracle product, since it only stays on the skin for a few mere moments, that doesn’t mean that using a great cleanser is not important. By great, of course, I mean that the cleanser is gentle, non-drying (hydrating, even! ), and with a non-disruptive low pH. It’s the perfect cleanser for anyone no matter the skin type to use before the rest of their anti-aging skin care routine. It can be bought at Sephora. If you have oily skin that is showing signs of aging, heavy sunscreens can be an issue, so this serum with an SPF would be one of the best anti-aging products for you. It has a wonderfully high 50 SPF, and it works beautifully under makeup. You can use it both with or without a moisturizer, as it contains antioxidant and repairing vitamin E as well as hydrating glycerin. Find it through Net-a-Porter! Exfoliation is key to keeping the skin looking young and taking moisturizers in, but some people just don’t like the extra step of an exfoliating serum or toner. That’s why this resurfacing moisturizer is so great. It removes dead skin with a blend of alpha-hydroxy acids, while also hydrating and plumping it up with hyaluronic acid. It is a great anti-aging product for all skin types, and you can purchase it from Sephora. While collagen itself is simply a nice moisturizer, that doesn’t mean this serum doesn’t help rebuild and fortify the skin! It contains some really respectable ingredients, including alguronic acid, niacinamide, and all kinds of peptides. Customers rave about its ability to thicken up their skin! Pick it up from Sephora! This light anti-aging cream is perfect for applying to face, neck, and chest, no matter your skin type, as it has a texture that sinks in quickly, but its ingredients are extremely active. It contains a whole host of super antioxidant plant extracts and skin-rebuilding proteins, along with proven actives like niacinamide, hyaluronic acid, and coenzyme Q10. It is sold online at Net-a-Porter. This moisturizing cream contains SK-II’s famous Pitera, a rice ferment extract that hydrates the skin and strengthens the microbiome, but in addition to that it is rich in some proven actives, including niacinamide, proteins, and peptides. It moisturizes the skin well and delivers serious anti-aging benefits. Get it from Sephora! This ginseng-based toner instantly firms up and refreshes the skin, and prepares it to absorb all of the best anti-aging products that are applied afterwards. It can be used instead of or in addition to a serum, at it contains powerful antioxidants, skin-brightening licorice extract, and plumping hyaluronic acid. It is available for purchase at Sephora. With retinol at 0.1%, this moisturizer is one of the biggest of the anti-aging skin care guns. Retinol, a form of vitamin A, is one of the most well-researched anti-aging ingredients, and it is known to work well and fast. This also means that it’s heavy-duty, and has the potential to sensitize. This anti-aging cream also contains peptides that may help with promoting collagen production, as well as antioxidant botanical oils. It should be used in conjunction with a more hydrating serum or lotion, and is great for all skin types except the very sensitive. Order it online from Dermstore! There is a combination of things women are usually referring to when they express their concern about skin aging, and these are also the things skin care companies aim to solve with their products. The first, of course, is wrinkles – the lines, folds, and ridges that start appearing in our face as we age, and as our skin struggles to reproduce collagen and elastin. One day you look in the mirror and see that those folds that show up when you smile or frown do not fully go away once your face relaxes. A little later on, this loss of elastin leads to a more drastic loss of tone that leads to the skin sagging, especially around the jawline and at the neck. Other symptoms considered part of skin aging include increased fragility, dryness, and having thinner, more transparent skin. Hyperpigmentation is also considered part of skin aging. The bulk of skin aging has to do with our genetics, plain and simple. This kind of aging is known as “intrinsic aging.” Some people’s skin continues to produce collagen and elastin into a later age just because they won the genetic lottery, and unfortunately there is nothing that topical anti-aging skin care products can do about that. We cannot do much about our body’s natural aging process, and because of that I don’t think there is any purpose worrying about that. You can certainly turn to more dramatic procedures like injections and fillers, but for many people that seems extreme. Because of that, I’ll focus the article on “extrinsic aging,” which I mostly refer to as “premature aging” – the signs of the aging process that are caused by environmental factors, and not because of genetics or internal processes. These are also the parts of the aging process that can be prevented and mitigated with the help of topical anti-aging products. The primary cause of extrinsic aging is likely to be free radical damage, which mostly comes to us courtesy of the sun as well as from various kinds of pollution. Free radical damage refers to highly reactive molecules that have an unpaired electron. These molecules will steal electrons from any source they find, leading to an oxidation reaction. This reaction breaks down skin cells and impedes their ability to behave well or multiply effectively. There is some disagreement in dermatological literature as to whether the sun causes extrinsic aging because of free radical damage or because sun exposure causes inflammation in the skin. While most experts consider free radical damage the primary cause of premature skin aging, inflammation is likely also relevant to the process. While a little bit of inflammation (like the kind brought on by a laser treatment or an acid peel) can trigger a reparative response in the skin, chronic inflammation is very likely to hurt the cells’ ability to regenerate and speed up collagen and elastin loss in the skin, leading to wrinkles and loss of tone. Keeping the skin in an overall healthy condition is a key way of preventing unnecessary inflammation and thereby keeping the skin youthful for longer. Using the right anti-aging products is the first step to getting rid of wrinkles and preventing premature skin aging. But what products should you go for? Face sunscreen is by far the most anti-aging of all of the anti-aging products out there – even the cheapest sunscreen is more important than the most expensive anti-aging wrinkle creams without an SPF. All of the anti-aging treatments in the world are totally useless if one is not also protecting their skin from the sun. If this sounds extreme, consider the fact that the bulk of visible skin aging that is not related to genetics is caused by sun exposure, especially in those that don’t expose their skin to other free radical sources like pollution or cigarette smoke. Just looking at all the avid tanners you know who are over 40 – their skin is usually visibly less firm and more wrinkled than the skin of those who avoid the sun. Research done in Montpellier in France on just under 300 women showed that the women categorized as “sun seeking” based on their sun exposure habits had skin that showed more signs of aging than the skin of women who were categorized as “sun phobic”. By wearing sunscreen on a regular basis, you can seriously slow down the visible signs of aging. These days you can find sunscreens in all kinds of formulas, including two-in-one moisturizers, primers, or even foundations. There are also quite a few sunscreens out there that contain other excellent anti-aging ingredients, for a comprehensive effect. To get the full effect of the sunscreen it is important to apply enough of it – I go into more details about that later on in the article. Moisturization is extremely important for treating signs of aging in the short term. Even the most basic moisturizer will have an anti-aging effect, since by loading the skin up with moisture you can instantly plump it up, making wrinkles and fine lines significantly less pronounced. Additionally, well hydrated skin functions better and acts as a more effective barrier, so by moisturizing regularly you can keep your skin healthy, thereby preventing inflammation and keeping the skin cells functioning regularly. This is an important part of preventing premature aging. Beyond this, though, moisturizers can be excellent tools for loading the skin up with additional anti-aging ingredients like antioxidants, collagen builders, and even skin resurfacers. In the daytime, a moisturizer with an SPF can work double duty to prevent premature aging and to reverse its effects. I’ve grouped these three types of anti-aging products together because in their anti-aging form they serve the same kind function in a skin care routine. Toners, serums, and essences may vary in texture, but they are all much lighter than a typical moisturizing cream, and as such they sink into the skin more quickly and are better suited to delivering potent anti-aging ingredients. Those with oily skin who are concerned about premature aging might even choose to use an anti-aging serum or essence instead of a moisturizer! While one can certainly get away with only using a facial cleanser and moisturizer or a cleanser and serum, there are some serious benefits to layering skin care products of various textures. First, this is an easy way of loading the skin up with more comprehensive hydration. Second, it is a better way of combining various actives in one skin care routine. Trying to get all of your vitamins, exfoliants, and peptides from one product is possible, but you will get bigger benefits from each ingredient if they come separately. For example, you can use a serum with vitamin C and AHA, and then afterwards use a moisturizer with vitamin A, peptides, and niacinamide for more thorough anti-aging benefits. These days there are a ton of hydrating and anti-aging toners on the market, but you will still find highly astringent toners that might even include alcohol. These will usually be advertised as “mattifying,” “pore minimizing,” or “skin tightening.” Anyone wanting to prevent extrinsic aging should avoid these kinds of toners, as they can seriously dehydrate the skin. Anti-aging cleanser is a bit of an odd phrase, since a cleanser cannot really deliver powerful anti-aging ingredients to the skin. This is because cleansers are only in contact with the skin for as long as it takes them to break down impurities. While there is no need to splurge on cleansers that contain expensive peptides or delicate antioxidants, a good cleanser is still important. Harsh cleansers that contain sulfates or disrupt the skin’s pH can harm the skin and prevent it from functioning well, while a gentle cleanser can keep the skin clean yet hydrated, and ready for absorbing leave-on anti-aging products. Oil cleansers are great for those with maturing skin, as are gentle, humectant-laden, sulfate-free cleansers with a pH between 4.5 and 5.5. In my opinion, it is perfectly acceptable to use a moisturizer around the eyes, although that doesn’t mean that eye creams don’t have an important space in an anti-aging skin care routine. The skin around the eyes is thinner and more delicate than the skin everywhere else on the face, so it tends to show age before other parts of the face. Additionally, the area surrounding the eyes tends to show signs of aging in slightly different ways. Fat deposits can build up below the eyes or, alternatively, because of the thinness of the skin there, the area can appear dark. Eye creams will usually have a gentler formula free of high percentages of potentially sensitizing ingredients like retinol or AHA. Instead, their anti-aging effect will come from blends of skin-tightening anti-inflammatories for puffiness, antioxidants for protection, and skin rebuilders for thickening up the skin. So which are the best anti-aging skin care ingredients that are excellent at removing wrinkles and mitigating signs of skin aging? Skin resurfacers fall into two camps. In the first camp we have the chemical exfoliants or keratolytic agents, like alpha hydroxy acids (glycolic or lactic acid, for example), salicylic acid, and the like. By removing dead skin, the skin is better able to absorb other beneficial ingredients, and cell turnover is improved. Then we have vitamin A derivatives, which normally show up in topical anti-aging skin care as retinol. Retinol is not an exfoliant, but it does help with cell turnover. Retinol regulates cell reproduction and promotes cell regeneration in the skin, including the regeneration of collagen and elastin. One of the bigger secrets to fine line prevention is antioxidants, the benevolent ingredients that protect us from free radical damage. Free radicals are incomplete molecules that steal electrons and lead to a destructive chain reaction called “oxidation” – that’s right, the same oxidation that leads to rust or faded car paint. There are thousands if not tens of thousands of different antioxidant sources used in anti-aging skin care, since antioxidants occur everywhere naturally. Some antioxidants are oil-soluble, while others are water-soluble, so the best anti-aging products will include a diverse collection of antioxidants instead of relying on just one or two. The most commonly used antioxidant ingredient is vitamin E, since it is well researched. In addition to protecting the skin from free radical damage it also stabilizes cosmetic formulas. Other proven antioxidants that often show up in anti-aging skin care formulations include vitamin C, alpha-lipoic acid, coenzyme Q10, beta-carotene, ferulic acid, and resveratrol. Additionally, there are a ton of plant extracts and oils that are naturally rich in antioxidants, including the antioxidants I’ve listed previously. For example, sunflower oil contains a ton of vitamin E, while calendula extract is extremely rich in beta-carotene. Other extracts and oils rich in antioxidants that you will see show up in anti-aging skin care include green tea extract, calendula extract, rosehip seed oil, argan oil, licorice root extract, and a ton more. It’s also worth mentioning that cosmetic companies are often looking for the next big natural extract to promote as the most antioxidant thing ever – usually these claims are not worth falling for, as the best anti-aging products would include diverse sources of antioxidants both synthesized and from extracts and oils. As I mentioned earlier, a second theory of skin aging posits that it happens as a result of inflammation, and that by preventing irritation in the skin it is also possible to slow down the process of extrinsic aging. Regardless of whether this is true or not, anti-inflammatories are a fabulous addition to one’s anti-aging skin care routine, as they usually also have skin firming effects that can momentarily get rid of wrinkles, or at least make them look smaller. Additionally, most anti-inflammatories also act as antioxidants, so no matter what, they will definitely help prevent skin aging to some extent! Some common anti-inflammatories that also have a skin-firming effect include cornflower extract and caffeine. These ingredients often show up in eye products, since they can help reduce the look of under-eye bags. Willow bark extract and green tea extract are both wonderful skin soothers that also have antioxidant effects. Willow bark extract is an especially great anti-aging ingredient for those with acne-prone skin, since it multi-tasks by reducing acne-related redness. Hydrators and humectants offer a quick and easy option for improving the look of the skin, not to mention its feel, while in the long term they help protect the skin from irritation and inflammation that can speed up skin aging. When we’re young, humectants like glycerin and hyaluronic acid occur in our skin naturally, but they become depleted as we age. Humectants work by penetrating into the top layer of the skin, and then absorbing moisture from the air as well as the products they come in, and bringing it into the skin. This instantly saturates the top layer of skin with water, plumping it up and making wrinkles and fine lines less visible. It also turns that top layer of the skin into a better barrier that is more resistant to damaging inflammation. Hyaluronic acid, in particular, stands out. It is a superstar humectant, primarily because it is able to hold a massive quantity of water, especially when compared to other humectants. This means that in the short term it plumps up the skin significantly. However, it also deserves extra praise because, in addition to being hydrating, it also has antioxidant properties. In many anti-aging serums and creams, multiple types of hyaluronic acid will be used, with molecules of different sizes. This allows hyaluronic acid to penetrate into various levels of the skins, making sure it is thoroughly hydrated. Some humectants, especially glycerin, are said to help improve overall skin functioning by supporting the cell maturation process. There are many other excellent humectants you will see used in anti-aging skin care, including panthenol (pro-vitamin B5), betaine, propylene glycol, sodium PCA, sodium lactate, and in recent years also sugar alcohols like xylitol and sorbitol. Proteins and amino-acids also have a moisture-binding effect on the skin when applied topically. It is very important that humectants be paired with occlusive and emollient ingredients (especially botanical oils and ceramides), which will work to create a light barrier over the skin to prevent any moisture from evaporating and will also prevent nasties like bacteria from getting into the skin. In anti-aging serums and moisturizers, you can almost always trust that this pairing is there. Recently we’ve also seen a lot of ferments or yeast extracts showing up in anti-aging skin care. These ingredients are known as “probiotics” and they are especially beneficial for rebuilding the skin’s microbiome. They have a skin-fortifying and hydrating effect, and can also prevent redness and sensitivity. However, these ingredients are not appropriate for those struggling with fungal skin conditions. One claim that cosmetics companies often make about their anti-aging skin care is that one (or a few) of the ingredients in their formula promotes collagen or elastin production in the skin. More often than not this is a claim that has not been sufficiently substantiated by scientific research. The FDA will occasionally send warning letters to companies making these kinds of claims, since they are considered “drug claims” and therefore cannot be made in relation to mere cosmetics. However, that is not to say that these companies are just making things up – it just means that the research they’ve done is not yet enough to prove that these anti-aging ingredients work. Most frequently this claim comes up for peptides, which are short chains of amino acids combined by a peptide bond. In our skin, when collagen starts breaking down it naturally forms peptides, which signal that new collagen needs to be produced since the skin has been damaged. The logic behind using peptides in skin care is that once applied, they will trick the skin into producing more collagen. However, whether peptides in an anti-aging cream are actually capable of doing that in the same way as naturally occurring peptides is not something that has been conclusively proven. Reading research (that is usually done by the companies trying to sell the product) and reviews, it does seem that serums with peptides do have the ability to strengthen and smooth the skin out somewhat. They can be a worthwhile addition to a comprehensive anti-aging skin care routine, especially if you’re already using sunscreen, exfoliants, vitamin A, and antioxidants, but contrary to what some brands claim, peptides alone are not the miracle to remove wrinkles. Plant stem cells are yet another type of ingredients that will supposedly magically get rid of wrinkles by acting like human stem cells to trigger cell renewal. This time it is actually pretty clear that this is all buzz and marketing, as there is absolutely no good research or proof showing that topical plan stem cells actually work like that, and it is why we haven’t listed any stem cell products on our list of the best anti-aging skin care products. When Should You Start an Anti-Aging Skin Care Routine? The truth is most of us start using anti-aging skin care at a much younger age than we imagine. I suspect I first started using anti-aging skin care when I was around 2 or three years old. Does that sound wild? If you think about it, you might realize that the same is true for you. As I’ve previously mentioned, the most powerful anti-aging product is sunscreen, so if your mother slathered you in it in the summers when you were a child then that counts as anti-aging skin care. Thinking about preventing premature aging with skin care is reasonable at any age, although that is not to say that anyone needs to obsess over it. There can be plenty of benefits to introducing various anti-aging ingredients into your routine, no matter your age, but I will give some advice based on each decade of one’s life. When we’re teenagers, chances are our primary skin concerns have to do with oiliness and acne, since these are the years when hormones go wild, and breakouts often start popping up. While treating primary skin concerns and keeping the skin balanced and healthy should be the primary focus of a skin care routine in the teen years, there is room for a youth-preserving touch. After all, any damage the skin accumulates over the teens and early twenties can show up later on in the late twenties and early thirties. • Teenagers should definitely use an SPF of at least 30 in the daytime, both to prevent sunburn and skin cancer, but also to prevent the sun’s harmful rays from breaking down the skin. The SPF can come from a lightweight, oil-free moisturizer or from a dedicated sunscreen. • Another useful way for teenagers to use anti-aging products would be in the form of antioxidants that double as anti-inflammatories. Antioxidant-rich ingredients like green tea or willow bark extracts stop free radical damage, which causes premature aging in the skin, but they also act as soothing and healing agents, which can be very useful if one’s skin is irritated from breakouts. • Hydrating toners or light moisturizers for oily or combination skin that also contain these kinds of ingredients will do a great job of keeping the skin healthy on all fronts. • Young people with dry skin should use a heavier moisturizer, of course, but look for the same skin-fortifying and protecting ingredients. • Additionally, teens and those in their early twenties still suffering from breakouts might find themselves getting an anti-aging touch from acne-fighting skin resurfacers like salicylic acid or vitamin A. Once we hit our mid-twenties it’s time to consider aging prevention just slightly more head-on. • In addition to still using sunscreen, keeping the skin well hydrated should become a primary concern, so definitely use a moisturizing product, either in the form of a serum or moisturizer. • Your serum or moisturizer should also include a high amount of antioxidants, as these are some of the best ingredients for preventing free radicals from taking their toll on your skin and speeding its aging. After all, this is the age where you want to focus on maintaining what you already have. • Regular exfoliation also becomes more important at this age, in order to aid your moisturizers and serums penetrating into the skin, and in order to keep your cell turnover rate steady. You can also choose to start using retinol, but it’s not quite so important yet unless you’re also dealing with acne, scarring, or hyperpigmentation. As always, chemical exfoliants are a better choice than physical ones. • If you have some specific concerns regarding your eye area, you can also consider adding an eye cream to your routine, but your serum or moisturizer will likely suffice for keeping it moisturized and protected from free radical damage. • At this age you are also not quite in need of collagen building anti-aging ingredients, since your skin shouldn’t have started to sag yet! The super expensive products that contain all different kinds of peptides will not do much to help your skin. At this age range it is possible that you have kept up a perfect anti-aging skin care routine filled with antioxidants and regular exfoliation, and that you have been using sunscreen religiously. It’s also possible that you’ve only tuned in to the skin care world now. Either way, the sunscreen, exfoliation, and antioxidant serums and creams have not lost any of their importance, so they should either remain part of your skin care routine, or perhaps it is time to introduce them. • You will likely notice your skin beginning to get drier, so you might want to switch to a more nourishing moisturizer formula. • This is the age range when the skin starts to lose significant amounts of collagen, and when fine lines and wrinkles really show up. Because of that, this is also the time when you should definitely add the strongest of skin restorers to your routine: vitamin A, either in the form of retinol or prescription tretinoin. • For an extra boost, you can make sure to pair it with other skin-restoring ingredients, like vitamin C or niacinamide, which may have already been part of your routine, since they also have antioxidant and skin-brightening functions. • You might also want to throw in an anti-aging eye cream while you’re at it! There shouldn’t be a big change between your anti-aging skin care routine in your forties and your skin care routine in your fifties or even later in your seventies. Hopefully, up until now you have been taking great care of your skin! • Sunscreen should still be your god, and good cleansing and moisturizing habits are even more vital now, as your skin will be struggling to produce its own humectants and emollients. • Since the skin gets thinner as we age, you might find it also becomes a little more sensitive, so reducing chemical exfoliation to just once or twice a week might be prudent. • Retinol can still help support skin cell renewal, while antioxidants will continue to protect your skin from external damage. • This is also the age when you might want to consider adding peptides to your routine, as an extra layer of reinforcement. How to Choose the Right Anti-Aging Products for Your Skin Type? Those with dry skin see very little oil production throughout the day, and their pores tend to be on the smaller side. As we age, our oil glands tend to become less and less active, which is why most older people have drier skin. For women this is especially true after menopause. In the case of a lot of skin care brands, anti-aging is seen to be directly correlated with dry skin, which is why a lot of anti-aging products are very creamy and moisturizing. When searching for anti-aging skin care products for dry skin types, chances are you won’t have a hard time finding products that are a good fit! Most anti-aging moisturizers and serums will suit your skin types, and you are likely to find out that layering products is especially beneficial for you. It is very important that you wear sunscreen in the daytime, although sunscreens and moisturizers with an SPF might not give you enough hydration, so definitely apply a serum or moisturizer before applying your sunscreen – just make sure to give everything enough time to sink in before applying any additional layers. Look for leave-on anti-aging skin care that contains a lot of humectants and antioxidants. With your skin type gentle cleansers are particularly important, and you should avoid dehydrating skin care products with SD alcohol or ethanol. Those with normal and combination skin see a moderate production of oil in their skin. Those with normal skin will have medium sized pores all over their face, while those with combination skin will have smaller pores in some parts of their face and larger pores elsewhere. Combination skin is very common, especially from the late-twenties to mid-forties, while normal skin is extremely rare. As with all other skin types, only using gentle cleanser is very important for keeping the skin looking healthy and youthful. Finding the right anti-aging moisturizers and serums can be a little tricky, as you want anti-aging products that will strike a balance between moisturizing the skin sufficiently without ever making it feel greasy. You may find that a nourishing serum provides enough moisture for most of your skin, while only the drier parts require a moisturizer. Mixing a moisturizer and serum together in the palm of your hand before applying is also a great way of controlling exactly how heavy what you put on your skin is. In the daytime, chances are you will not need a serum or moisturizer under your sunscreen. Oily skin can be recognized easily, as the oil glands are overactive so the skin turns shiny very quickly after it’s been washed. Those with oily skin also have larger pores, usually, and their pores tend to get clogged more easily, leading to blackheads, whiteheads, and pimples. Not everyone who has oily skin suffers from acne, nor do all people who experience breakouts have oily skin. However, the two come hand in hand often enough that I decided to combine the two sections. While a lot of anti-aging products are simply too greasy for those with oily skin, these days there are increasingly more lightweight, non-comedogenic options as well. First things first, look at texture descriptions for anti-aging products in order to understand how light or greasy they might be. You want to use light products that will sink into the skin quickly without leaving an oily sheen. Light oils like rosehip or sunflower are okay to use, even with oily skin, but avoid creams with heavier oils like mineral oil, particularly in the daytime. While mineral oil will not cause breakouts, it does leave the skin looking greasy. Many people with oily skin find that the best way for them to prevent extrinsic aging is to use anti-aging serums in conjunction with a skin-mattifying beauty routine. They can use serums or an essence instead of creams, or use serums below light moisturizers for oily skin. Every once in a while, they can use a clay-based mask for a mattifying deep cleanse, and layer anti-aging products afterwards. There are a lot of products made for acne-prone skin that also provide an anti-aging effect. I’ve previously mentioned vitamin A, a skin-repairing and retexturizing ingredient that helps to reverse the visible signs of aging. This ingredient is also often recommended for clearing up acne, and its strongest version, tretinoin, is often prescribed by dermatologists both for age prevention and for acne treatment. Salicylic acid, or BHA, is a chemical exfoliant that is frequently recommended for treating acne and clogged pores, but also resurfaces the skin to promote healthy functioning. Vitamin C can help to brighten up any hyperpigmentation left behind after a pimple, and it can also help to protect the skin from free radical damage and to promote collagen production, especially when paired with vitamin E and ferulic acid. Those with sensitive skin have to be the most careful when choosing anti-aging products for them. If your skin gets red, irritated, or itchy easily then that’s a sign of sensitive skin. Signs of sensitivity can show up after exercising, being out in harsh weather, drinking alcohol or spicy food, or because of the use of harsh skin care products. Sensitive skin can be caused by specific skin conditions like rosacea or eczema, as well, but this advice would apply regardless of the cause of the sensitivity. I am not recommending the types of products that will eliminate sensitivity, but products that will help prevent extrinsic aging without causing any irritation – hopefully they can even soothe the skin. Look for anti-aging products that do not contain unnecessary skin sensitizers like sodium lauryl sulfate or excessive fragrance. Some essential oils can also be irritating to the skin, although others find that essential oils like chamomile can actually calm their skin. Read product reviews to see if anyone complains about developing a rash or irritation after using it. Exfoliation is an important part of anti-aging routine, but using physical exfoliants is much likelier to irritate sensitive skin. While glycolic acid might cause your skin to tingle, especially the first time you use it, salicylic acid and lactic acid are less likely to do so, especially if you use them at lower percentages and with higher pHs. Some sources say that you cannot use chemical exfoliants if you have sensitive skin, but that’s not true – you just want to be careful. Other ingredients you might want to avoid, or only use carefully at very low percentages or only a few times a week include retinol, vitamin C, and other resurfacers. Once you’ve picked out a few anti-aging products you’d like to try, it’s very important you patch test them to ensure your skin can tolerate them. This means applying the product to a small patch of skin, either on the face or the forearm, and seeing how your skin responds. You can do this for a few days in a row if you’re worried about cumulative use causing irritation, which can happen with fragrances. Putting together an anti-aging beauty routine that will help get rid of wrinkles or at least prevent them can be an overwhelming process, especially when there are so many products and ingredients that you’ll have to include in your routine. After all, how much can you put on your face all in one day? I break it down step by step, in a guide that isn’t written like anti-aging skin care is one-size-fits-all! You always want to start off by cleansing your skin, using a gentle, sulfate-free, low-pH cleanser. If you wear makeup or heavy sunscreen in the daytime, then doing a double cleanse might also be a good idea. The cleanser itself doesn’t matter as much as your technique: you want to be as gentle as possible with your skin, massaging it gently and using enough product so that it doesn’t drag. Use upwards, circular motions that will help stimulate the muscles of your face as you allow the cleanser to break down dirt, sweat, oils, and makeup. Make sure you’ve removed your cleanser thoroughly, which will likely require the use of a damp muslin cloth, microfiber cloth, face sponge, or a cotton pad. Make sure to also cleanse your neck and chest! A toner is a totally optional step for boosting the skin’s hydration and infusing it with some additional antioxidants and anti-inflammatories. Saturate a cotton pad with your toner, and apply it to your skin in upward motions. If your toner comes with a spray top, simply mist it directly onto your skin. A toner with salicylic acid or alpha-hydroxy acid would actually count as an exfoliant. Chemical exfoliants come in the form of toners, serums, pads, and even creams. They are best used immediately after cleansing or toning. Apply your chemical exfoliant to your face, and allow it to sit for 15-20 minutes before applying the next product. Those with sensitive skin should likely avoid using chemical exfoliants on a daily basis. This would be the best time for you to apply a serum with vitamin A or retinol, especially if there is no vitamin A in your moisturizer. If your serum does contain vitamin A, and you have sensitive skin, you might want to alternate it with the days when you use a chemical exfoliant, or you might simply not want to use it every day. If there is already vitamin A in other parts of your routine, then any serum with humectants and antioxidants will be great! This is also your chance to infuse your skin with peptides, especially if you’re using a cream that doesn’t contain them. There are two schools of thought for applying anti-aging serums: you can press a dime-sized amount of it into your skin gently with the pads of your hands, and then wait as it soaks in. Alternatively, you can take another chance to massage your skin, by applying the serum with upward and outward circular motions, taking care to massage points that are prone to showing wrinkles like the area between the eyebrows and the nasolabial fold. Repeat the process for the neck and chest. If you have specific concerns for around your eye area, or if you prefer a dedicated product with specific ingredients or texture, the time to apply it is after your serum and before your moisturizer. You can even apply your serum around your eyes, and then lock it in with an eye cream. To apply our eye cream, dispense a ¼ pea-sized amount and rub it between your ring fingers. With your ring fingers, gently tap the eye cream along your orbital bone, being careful not to get too close to the eye itself. Apply the eye cream both above and below the eyes. Applying a cream is extremely important for anti-aging, especially if you have dry skin or if you don’t use a serum/ use one that is not moisturizing enough. Your cream should include additional anti-aging ingredients that are not present in your serum. For example, if your serum only has humectants and antioxidants, you should use a moisturizer that also has peptides or vitamin A. Once again, you will need a dime-sized amount of product for the face, and it is best applied in a gentle yet stimulating facial massage. You want your face to look glowy afterwards, but not red or irritated. Some people like to cleanse their skin in the morning when they first wake up, but it’s not mandatory. If you do like to cleanse, follow the same instructions as for the PM. Toning in the morning can be really nice, especially if you’re not cleansing, as a cotton pad saturated with toner will work quite well to remove the excess oils the skin might have produced in the evening. The morning is the best time to apply a serum that contains vitamin C, as it will boost the effect of your sunscreen. Otherwise, any serum rich in humectants and antioxidants (and maybe even peptides) will do the trick to give your skin an anti-aging dose in the mornings. Apply your serum the same way you would in the PM. Once you’ve applied your serum, give it plenty of time to sink in before moving on to the next step. If you prefer, you can choose to apply eye cream around your eyes in the daytime, especially if they get very dry. Apply eye cream the same way you would in the PM. Make sure to still apply sunscreen around your eyes afterwards, or opt for an eye cream with an SPF. Whether your sunscreen comes in the form of a moisturizing cream with an SPF or as a traditional sunscreen does not really matter. It can be very difficult to combine a moisturizer with a sunscreen, so unless your skin is extremely dry chances are that just one will suffice, especially if your serum is also hydrating. Apply at least a ¼ teaspoon of sunscreen in order to cover the whole face. If this seems like a lot, you might want to split up your application: massage an ⅛ teaspoon of sunscreen into your skin in quick yet gentle motions. Wait a few minutes for everything to sink in, and then repeat the process with another ⅛ teaspoon of sunscreen. If you are going to be out in the sun for longer than a cumulative amount of 2 hours, then make sure to bring your sunscreen with you so you can reapply. A single application in the morning is usually enough to protect you on the way to and from work or school, unless you sit next to non-UV protected window. Simple lifestyle habits can also help you get rid of wrinkles and signs of premature aging, which we discuss below. For our bodies to function properly it is extremely important that we get enough sleep – this includes all functions, including skin cell, collagen, and elastin production. By sleeping enough, you can ensure that your skin is given time to repair itself. Proper nutrition is key to keeping the body working optimally. Since the skin is the largest organ, diet can certainly have some impact on it! By eating a lot of healthy fats and antioxidant-rich veggies, as well as by drinking water a lot, you can keep your skin looking great for longer. People often focus all of their anti-aging skin care on their face, and up neglecting the rest of their bodies. Sometimes you’ll hear talk of not forgetting to apply creams and treatments to the neck and décolleté (just a fancy word for the chest), and even more rarely you might also hear people talk about the hands. While these parts of the body are more visible than others, I think the whole body can benefit from the use of skin-repairing and exfoliating anti-aging skin care. The regular use of a body scrub in the shower and a rich body cream afterwards should do the trick for keeping your skin firm and supple all over. Much like sun exposure, cigarette smoke can also overwhelm the skin with free radical damage. Various studies, especially on twins, have shown that regular smokers tend to look older than non-smokers due to increased extrinsic aging. The sooner you stop smoking, the more youthful your skin will look in future! Vampires do not age for a reason. By avoiding unnecessary exposure to the sun, you can further ensure its harmful rays do not damage your skin. In addition to wearing sunscreen and reapplying it religiously, you can also get added protection by wearing a wide-brimmed hat and sunglasses when you’re outdoors, and avoiding the outdoors altogether around noon when the sun is highest in the sky or when the UV index is especially high. Living in cities will certainly take its toll on your skin. Pollution, especially from cars, works very similarly to cigarette smoke in that it causes additional free radical damage to the skin. Living somewhere with fresh air is not an option for most of us, but the antioxidants in your anti-aging skin care can definitely help. Please be kind to yourself. When you start to learn about the various anti-aging treatments, it may seem as though each new product will be the miracle that will get rid of your wrinkles, especially because brands tend to set expectations way too high. They add insult to injury by advertising the products with the help of celebrities who are likely seeing a dermatologist regularly, and are using fillers and injections in addition to anti-aging skin care products. Even worse, they might use models who are much younger than they are presented to be. This often makes us forget what women are realistically supposed to look like once they hit a certain age, and in turn makes us feel inadequate, when in reality, a woman’s value has nothing to do with the amount of lines on her face. The anti-aging skin care ritual should be a form of self-care – a way of nourishing the skin and helping it function optimally. Once we forget that and start wishing for radical changes, the skin care process can turn into self-abuse, as we start spending too much money and piling unnecessary or even harmful products on our face. In reality the most attractive quality a woman can possess at any age is self-love, so make sure to nurture that first and foremost.